We now require someone to support our Oban Office Administrator. You will provide an effective customer-focused reception, telephone and general clerical service in addition to providing confidential admin assistance for our Manager and home-based staff. You will need to be comfortable using computers and Microsoft Office software, inc., Word, Excel and Outlook. You will be well organised and have excellent listening, verbal and written communication skills and be willing to undertake training to develop new admin and office competencies. A clean current driving licence and access to a vehicle will also be required as there is occasional travel to other Argyll and Bute locations to attend Board and Team meetings, PR events and training. The post is based at our Stafford Street office in Oban, 15 hours per week, Monday to Friday from 09.00 till 12.00. We may be able to offer some flexibility around actual start and finish times and we will require flexibility around the core hours on occasion to provide cover for annual leave for example. Salary will be paid at £9.07p/hr or £7,074.60 per annum for a 15hr week. We have a generous annual leave entitlement and you will also be eligible to join our excellent 4.7% contributory company pension scheme. or post your CV to ‘The Manager, Argyll and Bute Care and Repair, 5 Stafford Street, Oban, PA34 5NJ. Closing date for applications is 5.00pm on Friday 12th April 2019. Please feel free to call Steven Clarkson, Care and Repair Manager, on 01631 567780 if you would prefer to discuss any points before submitting your details. At the beginning of November 2018 Midton Acrylics in Lochgilphead notified us that we had been chosen by their staff as the local charity they would most like to fund raise for during the following 12 months. The Midton staff pick a charity every year to support, so we were very excited to hear this and humbled to have been chosen given all the other worthy local charities out there. The Midton Charity team set themselves a target of £1000 for the year and have already organised and held 2 events, a Christmas Jumper day in December 2018 and a Pancake day on 5th March 2019, each with various fun and fundraising activities. These two events have already raised a third of Midton’s targeted amount and there are many other activities in the planning. We are very grateful for everything Midton are doing on our behalf and our staff hope to join in some of the fundraising efforts throughout the year. Well done and thanks to everyone at MIdton. Your efforts are greatly appreciated by all Care And Repair Staff and our Board Members. We are currently looking for a CRO to be responsible for the Bute and Cowal area. This is a part-time role, 2 days per week although there are possibilities that this could be extended at a later date. (Please note that during the induction process it is likely that the actual days and number of work days may vary week to week till training has been completed). Primarily, our CRO’s deal with major adaptions such as external ramp and stairlift installations and level access and wet floor shower projects. They provide a confidential and professional service assisting clients through the local authority disability grant process. This includes visiting them in their own homes, providing a design service, discussing costs, helping to raise additional finance if required, managing the contractor tender process, helping with all administration and providing advice and support throughout. It is vital that you can relate to our client group as you will be acting as their representative, so a sympathetic and caring attitude is a prerequisite. You will also be supporting our Occupational Therapist and Housing Improvement Officer colleagues so any experience and knowledge of their work and services would be advantageous. You will report directly to the Argyll And Bute Care and Repair Manager. However, this role is home based and therefore you will be responsible for effectively managing your own time and caseload. All materials and equipment including computer, broadband, phone, printer, files and cabinets, etc will be provided for you. A risk assessment of your proposed work/office area will have to be undertaken by our Health and Safety advisors. Technical drawing skills would also be beneficial. This role will also require you to undergo a PVG check by Disclosure Scotland (Protecting Vulnerable Groups). A background in a similar role or building services, housing services, planning or similar will be required allied to a relevant HNC level qualification in a construction or building related discipline. Salary will be in the range £27,500 to £33, 500 per annum (pro rata) dependent on skills, qualifications and experience. We also offer essential car users allowance and membership of our contributory pension scheme. or post to The Manager, Argyll And Bute Care And Repair, 5 Stafford Street, Oban, Argyll and Bute PA34 5NJ. If you feel you would like more information please call the Oban office number on 01631 567780 and we will ensure that your details and contact information are passed to the Manager who will get back to you as soon as possible. Argyll And Bute Care And Repair Are An Equal Opportunities Employer. At our recent AGM at the end of 2018, Helen Kessell decided to step down as Chair after a spell of 5 years. Helen and the Board have witnessed many changes during her time in charge of Care and Repair and have faced many challenges including ever tightening funding and budgets, personnel and management changes, introduction of the new HSCP and integrated service requirements, technology integration and introduction of new services and much more. The Board thanked Helen for her time, direction and guidance provided during her time as Chair. Helen will remain as a Board member ensuring that her experience and knowledge continues to benefit the Board and Care And Repair. 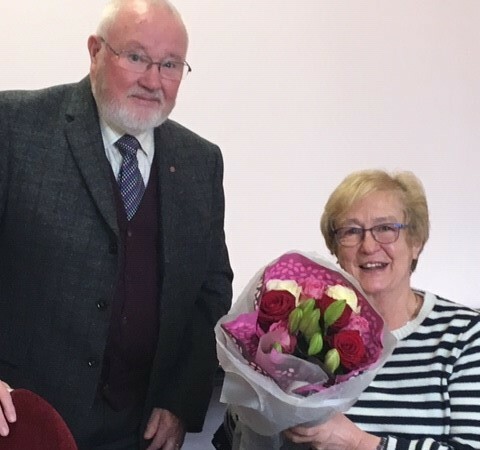 At our January 2019 meeting Tony Davey BEM, new Chair of Care And Repair, presented Helen with a lovely bouquet of flowers on behalf of the Board. Linda Meiklejohn, our Care and Repair Officer for Helensburgh and Lomond retired at the end of December 2018. Linda had been with Care and Repair for 17 years so her knowledge, skills and experience will be sorely missed, but we wish her a long and well deserved retirement. George Gall, who has been taking care of major adaptions projects for the Bute and Cowal area will now be taking over Linda’s area. George is very experienced, resides in Helensburgh and is familiar with local services, OT’s and Council Housing Information Officers. There will be some time for George to become familiar with all of Linda’s casework but we hope this will not interrupt or delay the service to our clients in Helensburgh and Lomond area. George can be contacted through the Oban office on 01631 567780. Les Kinvig has started with Care and Repair as our new Project Officer dealing with the Scottish Governments Equity Release pilot scheme for Argyll and Bute. Les takes over from George Gall who has done a great job getting this program off the ground and now returns to his Care and Repair Officer duties dealing with major disability adaptations for our clients. Argyll & Bute Care and Repair entered into a partnership with the Energy Savings Trust to pilot ‘Help for Homes’ – an equity release funded home improvement and energy efficiency service. The Home Energy Efficiency Programmes for Scotland: Equity Loans scheme (HEEPS: Equity Loans) provides equity loans of up to £40,000 towards the capital cost of installing eligible energy efficiency measures and essential repairs for owner occupiers and smaller private sector landlords. The pilot project, was launched in three Care and Repair areas including Argyll and Bute and offers assistance through the process by Care and Repair from application to completion of works for applicants who would benefit from support through the process. Les can be contacted at lkinvig@abcarerepair,co,uk or on 07880 234580 if you would like any further details or to arrange a visit. Alternatively please contact our Oban office on 01631 567780 and we will have Les contact you. Assist HSO with other referrals such as Telecare and Occupational Therapy minor adaptations work when required. The successfull person will need to have good general handyman skills and/or a trade background (joinery preferred) to carry out fitting and installation of a variety of safety and security devices from light bulb changes, battery replacements in alarms and detectors, changing fuses, fitting door and window locks & thresholds – These are carried out free of charge on referral to us from our Council, NHS and Social Care partners or can be self-referred. Also carrying out our private small repairs work – basic small plumbing, joinery and electrical repairs including fitting of shelving, assembly of flat pack furniture, tap washer changes, small paint and tiling jobs, etc. There is a small hourly charge for this service. 35 hrs per week Mon to Friday. A company work vehicle and tools will be supplied, therefore a current clean driving licence is essential. A PVG check and references will be requested for the successful applicant. This is a temporary position, funded for 6 months but may be extended or made permanent depending on outcomes and further funding. Salary between £17,500 and £19, 500 depending on skills, qualifications and experience. but a company application form will have to be completed prior to interview. Closing date for applications is Friday 4th August at 5.00pm. For a Job Description and Person Specification please contact our Oban office on 01631 567780 or to discuss the role in more detail call Steve Clarkson, Care and Repair Manager on 07786 175017. Argyll and Bute Care and Repair will be piloting the Scottish Governments new HEEPS: Equity Loan programme. This commences on 4th January 2017. Homeowners and private sector landlords in the Argyll and Bute council area can now take advantage of this Scottish Government equity loan, which is supported by the Energy Saving Trust, to help fund energy efficiency improvements and/or associated repairs to their property. An equity loan allows you to borrow against the value of your home (if there is enough equity available in the property). These loans do not require monthly repayments and repayment of the loan will only take place when the property is sold A cap is in place (currently 2.5% per annum) to ensure applicants who see a sharp rise in their property value will not be unfairly penalised. The maximum loan value is £40,000 but cannot be more than 50% of the property’s estimated market value. The homeowner must also retain a minimum of 30% equity in the property. Or call our main office on 01631 567780 and ask for Christine Burns who will take your details for George to call you back. Or, call Home Energy Scotland direct on 0808 808 2282. Hours: 35 hours per week (Monday – Friday) – Initially to March 31st 2018, but possible extension depending on success of the Pilot and continued Scottish Government funding. To develop and promote the Help for Homes Service in partnership with other Care and Repair offices and the Energy Savings Trust. To support vulnerable applicants utilising the scheme through the process from funding to completion of works. To collect and compile data to provide evidence of the outcomes of the service. Argyll & Bute Care and Repair has entered into a partnership with the Energy Savings Trust to pilot ‘Help for Homes’ – an equity release funded home improvement and energy efficiency service. The Home Energy Efficiency Programmes for Scotland: Equity Loans scheme (HEEPS: Equity Loans) provides equity loans of up to £40,000 towards the capital cost of installing eligible energy efficiency measures and essential repairs for owner occupiers and smaller private sector landlords. The pilot project, which is currently being run in three Care and Repair areas, will offer assistance through the process from application to completion of works for applicants who would benefit from support through the process. ‘Help for Homes’ Launched in mid-December 2016 in Glasgow, Argyll and Bute and Perth and Kinross and will run till 31st March 2018. Dependant on demand being evidenced and further funding being made available by Scottish Ministers the Equity Release service may be extended. A minimum of two years recent, direct experience of working in a related environment. ONC/HNC in Building, Quantity Surveying or equivalent Or time served trades-person with general building contractor experience. Excellent customer facing skills and ability to communicate at all levels. A well organised person, able to work on their own initiative as well as part of a team. Good IT skills and experience including Outlook, Word and Excel and using databases is essential. You will be sent an application pack including Job description, person specification, information for applicants and application form. All applicants will be required to complete and submit our company application form and if you are successful following interview, references and a PVG check (protecting vulnerable groups scheme) will be requested for you prior to taking up the post. We are committed to being an Equal Opportunities Employer and do not discriminate in any way. Closing Date is Friday 4th August 2017 at 5.00pm. Any applications received after this time will not be considered.